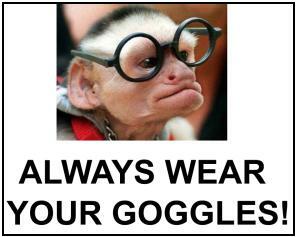 Monkey goggles – Monkeys love goggles. You should too! Goggles are for everybody – Even businessmen need to wear goggles in the lab! This is how the world ends – If you’ve ever wondered how the world is finally destroyed, here’s your answer: an unattended Bunsen burner. Don’t let this happen on your watch! Public service announcement – A goggle-related public service announcement with a sense of humor. Disturbing pictures of eyes – Sometimes a parody of scary safety posters can grab students’ attention more than the real thing. * Everything else on the site is posted under a Creative Commons Attribution-NonCommerical-ShareAlike 4.0 International license (CC BY-NC 4.0). For more information about this license and how it affects how you can use those resources, visit http://creativecommons.org . These safety posters, however, are totally open to any use you can imagine, so go nuts.